The timeline of Ancient Greece begins in the 8th century BC when Greece managed to emerge from the Dark Ages after the fall of the Mycenaean civilization. It ends with the annexation of Greece to the Roman Empire in 146 BC. Below is a timeline of the most important dates and events that occurred throughout this period. 776 BC: Date of the first recorded Olympic Games. 757 BC: The start of the First Messenian War, resulting in the subjugation of Messenia to Sparta and the creation of helots. 725 BC: The Lelantine War between the Ancient Greek city – states of Chalcis and Eretria, fighting over the fertile Lelantine Plain. This is the first recorded armed conflict in Ancient Greece. 621 BC: Draco, an Athenian lawgiver, introduces a series of harsh laws, also known as Draconian laws, in an effort to quell social conflict in Athens. 594 BC: Solon, an Athenian statesman, makes a series of reformations that eventually managed to preserve order in Athens, which the Draconian laws were unsuccessful at. 590 BC: Sappho, a Greek poet and priestess, flourishes on Lesvos. 569 BC: Pythagoras is born. 561 BC: Peisistratos takes power in Athens, establishing a tyranny. 507 BC: Cleisthenes takes power in Athens, establishing democracy. 490 BC: The Battle of Marathon takes place, resulting in the defeat of Darius. 480 BC: Leonidas and 300 Spartan soldiers die fighting a valiant battle at Thermopylae. At the same time, Athenians emerge victorious in the Naval Battle of Salamis, destroying the Persian Navy. 457 BC: Pericles, Athenian statesman, starts the Golden Age in Athens. 448 BC: Ictinus ad Callicrates rebuild Acropolis after it was destroyed by the Persians. 431 BC: The Peloponnesian War starts. 401 BC: Thucydides leaves a historical account of the “Golden Age of Pericles” and the “History of the Peloponnesian War”. 342 BC: Aristotle becomes the teacher of Alexander, son of Philip of Macedon. 336 BC: Alexander succeeds his father in the throne and starts a campaign against the Persians. 323 BC: Alexander dies in Babylon. The Wars of the Diadochi follow, with devastating results for the empire. 300 BC: Euclid publishes his great work Elements. 265 BC: Archimedes develops the homonymous screw, specific gravity and center of gravity. 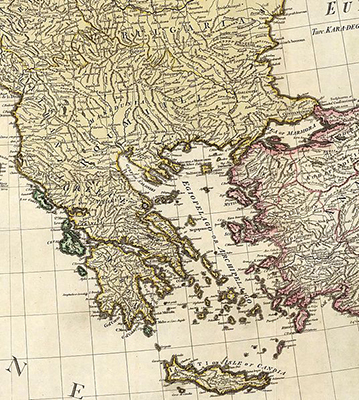 146 BC: Greece is annexed to the Roman Empire after a series of wars.